Questions such as this can make a great starter for a lesson and provide the chance to discuss number operations and the relationships between them. Manipulating numbers like this can also help with algebraic manipulation. 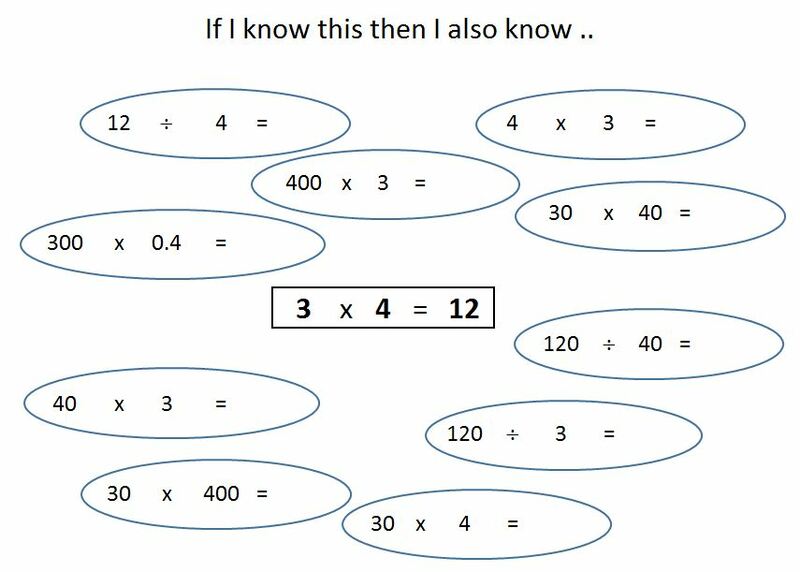 Looking for some more examples of this type, I came across a really useful resource on TES, “If I know this then I also know …” by Piers Butler. This would make an ideal lesson starter. As it is an Excel spreadsheet, I thought it would be simple to add another worksheet with the answers and created the Excel file CY If_I_know_this_then_I_also_know_ which is a copy of the original, but just adds another worksheet with the answers. Thank you Piers! I have added this to the Number collection on Mathematics Starters where you will find other ideas for Number starters. For more TES (free to register) Resources, see Secondary Maths Teaching Resources. or have a look at the Secondary Maths Resource Collections which includes collections of great resources by topic.